Gary Shteyngart is the author of two bestselling novels, The Russian Debutante’s Handbook (2003) and Absurdistan (2006). His upcoming novel, Super Sad True Love Story, will be published by Random House on July 27 and is one of the most anticipated books of 2010. 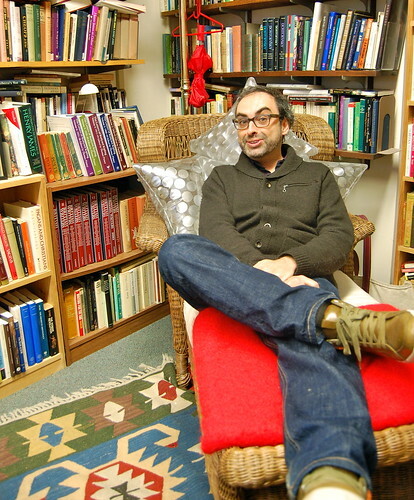 Shteyngart’s work has also appeared in Granta, The New Yorker, The New York Times, and Slate. He is a contributing editor to Travel and Leisure. Shteyngart was born in Leningrad in 1972 and moved to the United States when he was seven. He now lives in New York and is an Assistant Professor at Columbia University School of the Arts where he teaches fiction. He is the recipient of a painfully long list of literary awards and notable mentions. Shteyngart’s pattern of choice is plaid. He dreams of owning a longhaired dachshund. I started writing when I was a little kid, when I was four or five. My grandmother hired me. She was a journalist in Leningrad and she would pay me in little pieces of Soviet cheese for every page I wrote. So I started writing this story about Lenin and a magical Goose. They banded together and tried to forge a Soviet revolution in Finland, I think it was. Did you always know you were going to be a writer? Yes, because it was the only thing I was good at. I’ve been fired from almost every job I’ve had that doesn’t involve writing. My mind wanders, I’m a dreamer. How do your parents feel about you being a writer? What did they think before you were published? Bad! I kept having to tell them I was going to some kind of grad school. In Russian you say, “Who are you by profession,” and I had nothing to answer that question. So I kept having to send them brochures from grad programs, like the John F. Kennedy School, Urban Planning, Cornell, Columbia Master in International Affairs…just some kind of Masters Degree that would make them feel like I was doing something with my life. There is a funny New York Times Magazine piece that appeared when my first book came out where they interview my parents and my mother is like: “Maybe he should have been an accountant? I bet he would have been a good accountant.” Now that I’m making money, they’re okay with it. I guess they are proud in a strange kind of way. What were those five years of work like between graduating from Oberlin College and getting a book contract? I used to work at this non-profit that dealt with immigrant resettlement and I would help write directions for new Russian immigrants, like how to not get drunk, how to avoid AIDS, stuff like that. That took max a couple of days a month, really. And the rest of the time I would lock myself in my office and work on the draft of my first novel. Half of it was finished by my senior year in college and the other half was finished working that job. It wasn’t the kind of service job where I would come home exhausted. I would come home ready to write or would have accomplished the writing at the office. It was brilliant. I didn’t work more than two years at any one given place because there’d be lay-offs or people would realize I wasn’t doing anything. Here is a good thing to do when you are getting fired: sometimes you work for really nice organizations where there is a really sweet Jewish woman behind the desk, and you tell her you need unemployment benefits. In order to get unemployment benefits you can’t be fired, they have to say you have been laid off. Well, boy, did I get a lot of unemployment benefits. 400-500 dollars a week is what that would get me. Back then, life was much cheaper in New York City. You could live on that. If I had to have a job besides writing, I never wanted a corporate job, a profession. Because people who work law, medicine, finance, their entire lives are consumed by what they do. There is no room for writing. You have to be an insane person, like Chekhov. And Chekhov really didn’t practice medicine much. You need that job where you can close the door behind you. You need that concentration. The other problem now as opposed to then is that then there was no Internet. There was no distraction. Now, it’s impossible. It keeps going BING! at you. What would be on your grocery list from that time? I never really learned how to cook, which was a big problem. So I would live on dirt cheap take-out. There was one take-out where you could get rice and a little piece of beef for like $2.49. Then I would live off of chicken nuggets. Sometimes, when I felt flush, I would have Chinese food, for $4. The soup was always free. Hot and sour. What were you spending your money on at the time? Beer. Wine. Vodka. It was weird. I was really poor, but every once in a while I would get money together and throw a party with caviar and sturgeon and stuff— very Russian to blow it all in one night. I would live in these tiny apartments, 400 or 500 square feet, and I would cram 100 people in there. It was out of control. I had a fire escape and access to a roof at one point. The apartments were on the Lower East Side. In Park Slope before it was invaded by children. I helped to gentrify Fort Greene, personally. How long did it take to make money off your writing? Before my first book, I wasn’t publishing anything. I was just working on the novel. I graduated from Oberlin ’95 and I just kept re-writing my first book over and over again. I got a book contract in ’99 or ’00 and it was big enough that I could quit what I was doing and live on it. You went to Hunter College for your Master of Fine Arts in writing. You’ve mentioned that you were totally cut down in your workshop? Yes! There were a lot of people who really hated my work. “He’s too clever by half!” this German woman who spoke with a British accent used to say. But I got my book deal before I even started Hunter because Chang-Rae Lee, who was running Hunter, helped to get it published. So it was funny, because when people in my workshop found out that I had a book deal they were all like, “It’s great! Who’s your agent?” It kind of made the whole workshop thing feel ridiculous. An MFA is a terminal degree, you may die from it. In the end I don’t think you need one. But for me, I wanted Chang-Rae to edit this book I had been writing. He was the Master of Immigrant Fiction as far as I was concerned, so I really wanted to work with him. I was partying a lot. It really is a great lifestyle, which is why I sort of envy MFA students now. It’s a great opportunity to party with like-minded people. Get down with them. Before the book deal, while you were working those five years on the manuscript, did you identify yourself as a writer? No, no, no! Are you kidding me? I’m always shocked by Americans and their self-confidence. They haven’t published anything, and you ask them what they do and they say: “I’m a writer.” I say, “Oh, who is your publisher?” And they say, “Oh, well…I’ve been working on this book for the past 87 years and it’s brilliant but…” I do have to say that takes a lot of chutzpah and that’s wonderful. It really means that you think of yourself as a writer. I didn’t think of myself as a writer until the book came out. Was there ever a time when you wanted to give up? Looking back, I should probably have published my first book two or three years out of college, I just didn’t have the nerve to send it to a publisher. It wasn’t until Chang-Rae Lee read it. When Chang-Rae read it, it wasn’t entirely different from what it used to be a couple of years beforehand, but he just gave me this sort of courage. Well, he didn’t really give me the courage because he just sent it to the publisher himself! What’s it like being a writer today? I would say that writers are the most desperate people I have ever seen in terms of their utter lack of self-esteem. Their incredible alcoholism. Their way of life. Also, this feeling that they are no longer culturally relevant. I was watching Mad Men and there was some executive who flies in from somewhere and says, “Wow, we just saw James Michener by the pool!” Just the idea that writers were celebrities. That people, even some random executive from nowhere, would seek them out and know who they were. Did you aspire to fame and fortune? I never thought my books would sell. I thought I would be very much on the margins. Stuff about Russian immigrants, who the hell would want to read about that? I just wanted to eke out some kind of living. I never thought it would be my primary source of income. I almost thought there was something romantic about that. Sort of like Soviet writers in the time of the Soviet Union who worked very hard even though nobody would read it because the state censured it. There is a term for that which means, literally, that you “write into the desk.” As though the drawer of your desk is the only place your work will ever be found. What are your thoughts looking back? Before you publish your first book there is a sense that you are living an adventure. Something great can happen, something terrible can happen, and nothing can happen, which is the worst of all. But it is exciting. When your book is published and you’ve achieved what you wanted to achieve, the struggle isn’t there to the same extent. It’s not as fun and you feel like it’s work. Knowing you’ll be paid for it makes it more professional, and things are already more professionalized from how they used to be when Hemingway and Dos Passos and Fitzgerald roamed the globe. Because now everyone has this MFA degree and is obsessed with health care, insurance, pension. Once you enter the ranks of successful writers, you hand over the feeling that anything can happen. Then it becomes: I have to work so that I can keep up my lifestyle. They weren’t such bad times. I was drunk too much. But I really felt young. And I knew it every second. Everything mattered. Every party was interesting. Every conversation was interesting. Everything mattered. Now everything is just pretty much set. This entry was posted in Writers and tagged "Absurdistan", "Super Sad True Love Story", "The Russian Debutante’s Handbook", Columbia University School of the Arts Faculty, Gary Shteyngart. Bookmark the permalink. Interesting interview. It shows the single-mindedness that writers need to succeed – for example, hiding in his office to work on his book. Pingback: Celebrity Gossip, Get It Here First! I always suspected he was a Martin Amis fan!